Intimus 45 CC4 cross cut shredder is an innovative solution for a business needing a powerful and effective shredder. With its 9” wide feed opening, the shredder can take up to 11 sheets and shred them at an outstanding pace of 13.8 ft./min. The 45 CC4 achieves a security level of P-5 by creating particles of 5/64” x 19/32”, ensuring that the confidentiality of your documents remains intact. 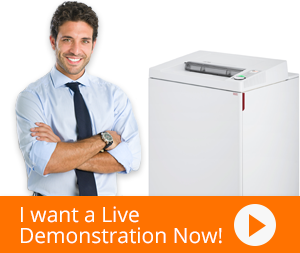 All components of this paper shredder are precisely engineered and made to last a long time. Similarly, the strong cutting blades of Intimus 45 are made of high-quality steel and are capable of shredding staples, paper clips, credit cards, and DVDs. To prevent the shredder from becoming a major source of disturbance, the paper shredder incorporates the innovative Silentec technology which allows the shredder to operate below the sound level of 55Db. Intimus understands that shredders are not complete without adequate safety features and user friendliness. Therefore the 45 CC4 incorporates several features that make it a safe and convenient paper shredder. All the basic functions can be performed using the control button on the top and automatic start/stop is controlled by light barriers. To save the users from the hassle of paper jams, the shredder features an auto reverse function that handles jams by reversing and powering through them. The paper shredder comes packed in an aesthetically designed robust casing that is dust proof and mounted on rollers for flexible usage.